Well! It’s been nearly a month since my last post – far too long. I’ve been busy with things like organizing my bourbon collection (finally) and being sick with a pesky summer flu – still have it in fact, so today’s post will be structured a little differently than usual since I’m not drinking at the moment. However, I haven’t neglected my brown spirits all together, in fact along with some help I’ve made some headway with a bottle of Laird’s Straight Apple Brandy. I’ve had Laird’s before this, but only their Applejack, which is merely their brandy diulted with neutral spirit – really a disappointing venture in all. So I was looking forward to sampling their good stuff. Before going any deeper into this post though, I have to note that the logo for this particular brandy is wonderful, the kind of thing apple brandy distillers should get tattooed on their forearms. I’ve written a couple times about apple brandies before, with American Fruits and Clear Creek, and the two seemed to represent a range from young & bright to more mature & mellow – as we’d expect comparing any liquor aged a few months to on aged a few years – but each also represented different approaches to the craft: Clear Creek is openly drawing inspiration from the French traditions around Calvados, while American Fruits seemed to be in more of an experimental mode and at the beginning of crafting what may or may not be a lasting line. 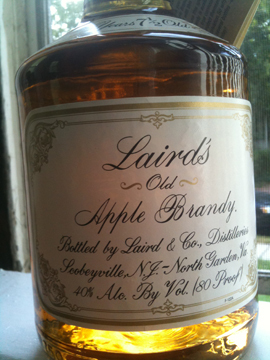 Laird’s is perhaps the standard when it comes to American apple brandies and it employs a process very different from those other two products. Instead of aging in limousin oak as Clear Creek does, they use charred American oak and age it six to eight years before bottling. In other words, they follow the same aging process as bourbon. The result is a brandy that is, at times, more bourbon-like. It’s a little brighter than Clear Creek’s, but far more apply. Since I’m not drinking it at the moment (much to my dismay), I can’t go into finer-tuned notes, but I can say that at its full 100 proof, it can be a bit much to take. I’ve found adding a bit of water brings out the cider qualities, and adding an ice cube or two makes it into a fine casual dram. All in all, I would recommend giving this a try – just avoid their Applejack.